Florence, Tuscany; The night of San Lorenzo, August 10, sometimes in the XVI Century. That is the night of the shooting stars, symbolizing in the popular imagination the hot coals on which the Holy man was martyred. Large braziers placed around the Church of San Lorenzo. Huge quarters of beef are cooking slowly over the braziers. The Florentine people are sitting on benches, on the steps in front of the church. Around the fire, they eat voraciously large portions of meat, while butchers improvised cooks keep going to roast and slice more cattle ready to be mauled. Florence in the ‘500 is prosperous and booming. The De’ Medici’s family rules the city with a firm hand and bright intuition; The banking system, invented and managed by this great Florentine family, brings into the city Lords and rich merchants from all over Europe. 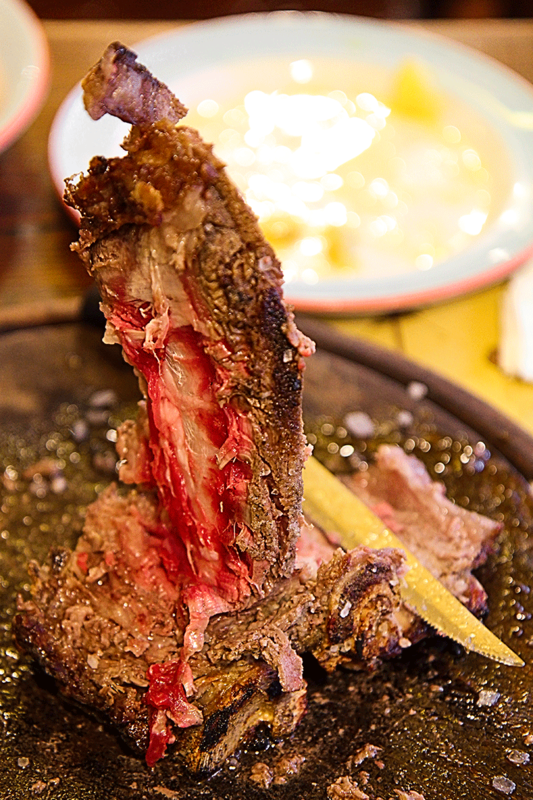 Right here history and legend intertwine together; a group of British aristocratic, attracted by the pantagruelian feast set up between the fires of San Lorenzo, sits next to the populace and bite the slices of meat with their noble teeth.”Beefsteak! Beefsteak!” Scream the hungry blue blood still asking more meat. From this hungry cry – beef steak! – was born the Italianate term of the most famous Tuscan dish in the world: the Bistecca. 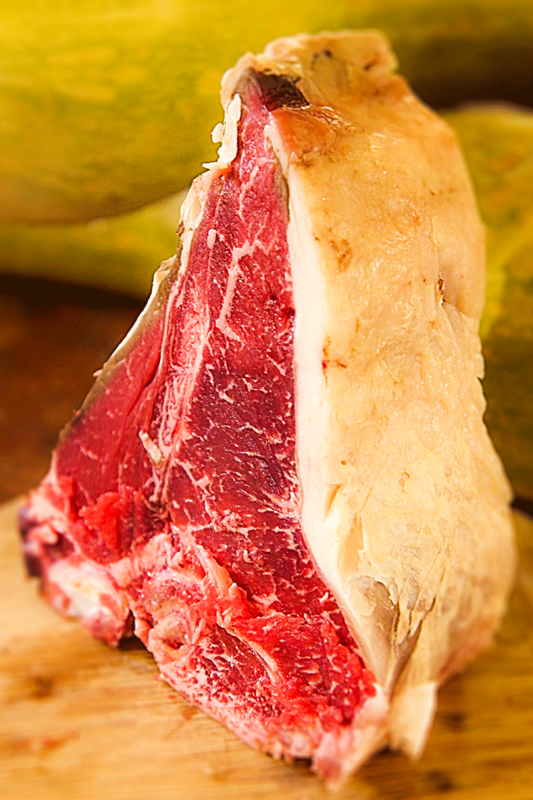 The Florentine Steak is a cut of meat made from the part of the loin near the leg of the Scottona (young female bovine that has never gotten pregnant, aged 15/16 months). 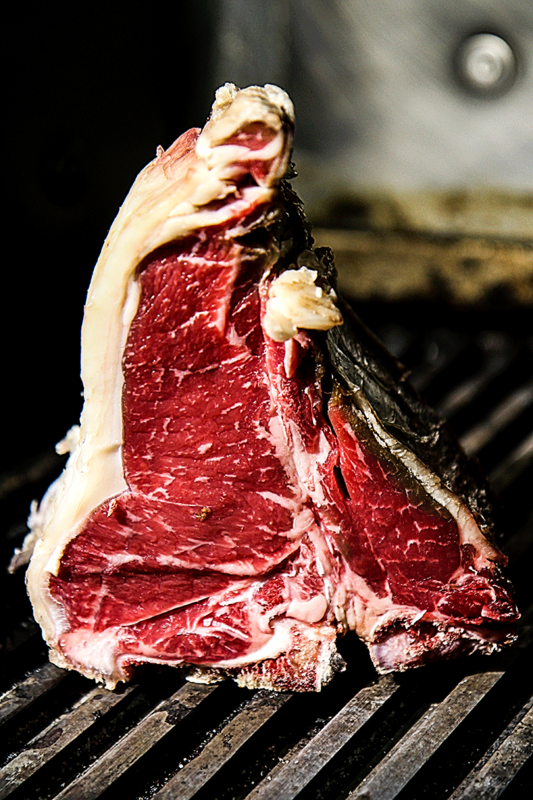 The cut of the Florentine steak must include a Porterhouse cut between the sirloin and the tenderloin; otherwise, it will be called ‘Costata’ (the only Sirloin with bone), and it is derived exclusively from the part of the loin near the shoulder. The meat is tender and tasty, so it must be well marbled, for this reason, the cattle must have the characteristics of the Scottona. Even the hanging has a vital role to ensure the flavor and softness; the whole loin must be hanged for a time varying between 15 and 21 days before cutting. The cutting of Florentine Steak in Tuscany is an ancient art; the minimum thickness for a Florentine Steak worthy of its name is of 1.5 inches, but the perfect cut is not less than 2/2.5 inches. The weight ranges from 1.5 lb to 4lb, but my favorite cut weighs 3 lb, a yummy feast to share with friends! BREED CHOICE: CHIANINA OR NOT CHIANINA? Several people in Italy think that the only breed apt to obtain a traditional Florentine Steak is the Chianina; This is only partly right. 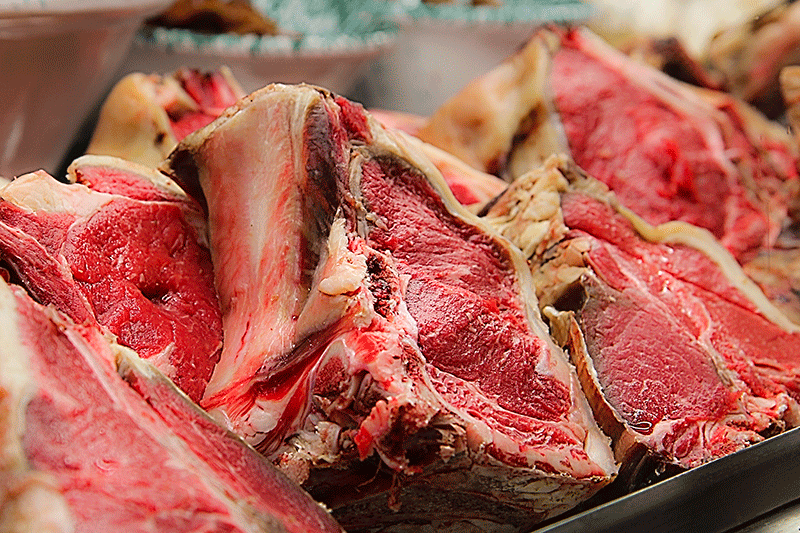 Although the Chianina produces a meat of excellent quality, many Tuscan butchers prefer other national races. Dario Cecchini, the most famous Italian butcher, serves in his butcher shop/restaurant in Panzano; a village in the province of Florence, an excellent Florentine produced by Spanish cattle! In Florence, all the city’s restaurants serve the T-bone Florentine Steak, but sometimes the results hit-and-miss. To make no mistake, I recommend some historical restaurants, which prepare and cook “the Queen of the meats” following the tradition. Among these, I suggest the “Trattoria Mario” near the Mercato Centrale, “I’ Brindellone” in San Frediano and “Perseus” near Piazza della Libertà. 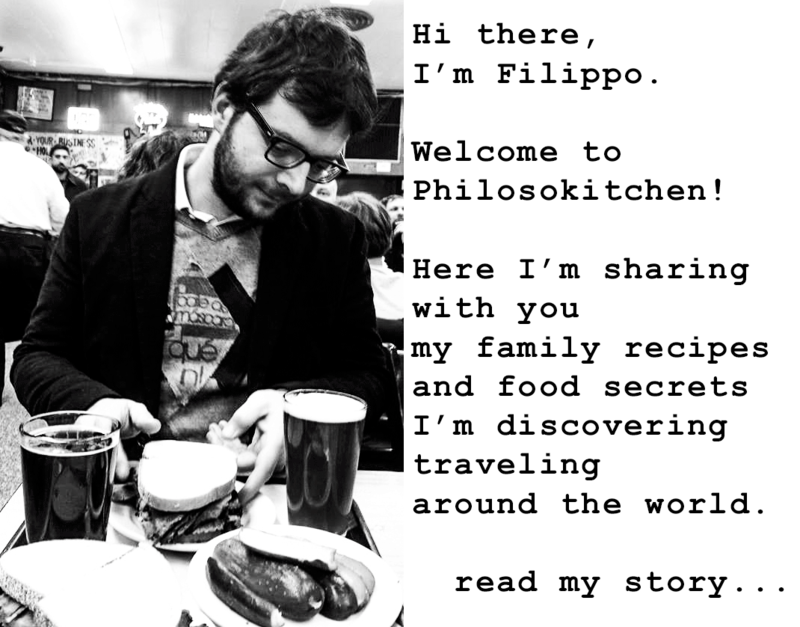 In my recent trip to Florence (click here to read my travelog!) 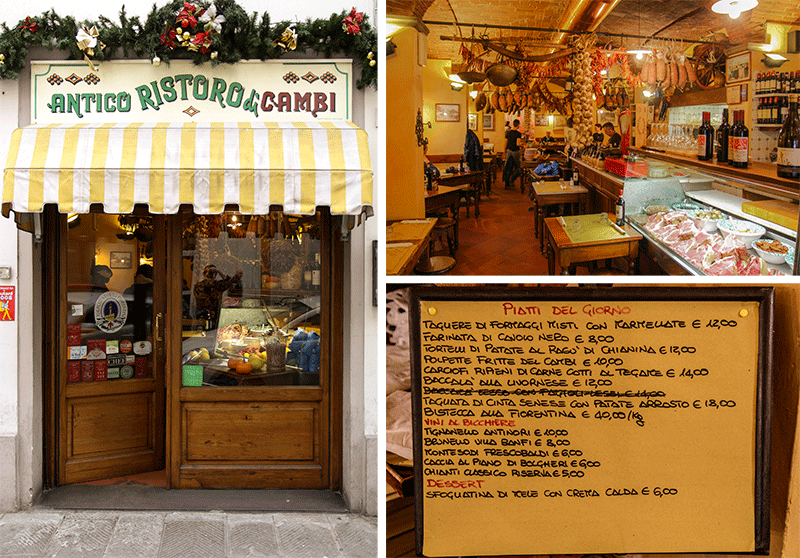 I ate a terrific Florentine Steak at “Antico Ristoro di’ Cambi”, in San Frediano and would highly recommend a visit! If you are planning to explore the countryside surrounding Florence looking for a delicious steak, one of the best choices is “Ristorante Tullio” in Montebeni, a little village near to Fiesole. Other places I strongly recommend are “L’officina della Bistecca” (where the owner Dario Cecchini cooks and serve the steak reciting verses from the Divine Comedy!) In Panzano, and “Osteria di Nandone” in Scarperia, a rough and spartan place but serving great steaks cooked on the fireplace. 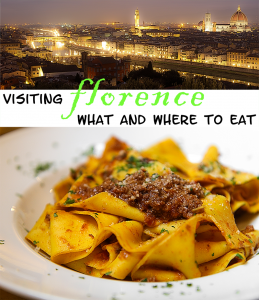 I must reveal to you a couple of tricks to figure out if after ordering the Florentine steak it is better to get out of the restaurant and run like hell! 1) The restaurant should give you the option to choose the Florentine before cooking 2) The cook does not have to give you the opportunity to choose the level of cooking, There is one only way to cook and eat the Florentine Steak: rare! In the past times, the Florentine Steak were cooked on the embers. Currently, especially in cities, the health rules in force make it tough to proceed with this type of cooking. Cooking Florentine Steak begins by standing by the bone on the hot grill for about 15 minutes. In this way, the bone will transmit heat to the meat without cooking it, relaxing the fat fibers. Once the interior of the steak is warm, it is cooked on high heat for 5/7 minutes each side, depending on the thickness. 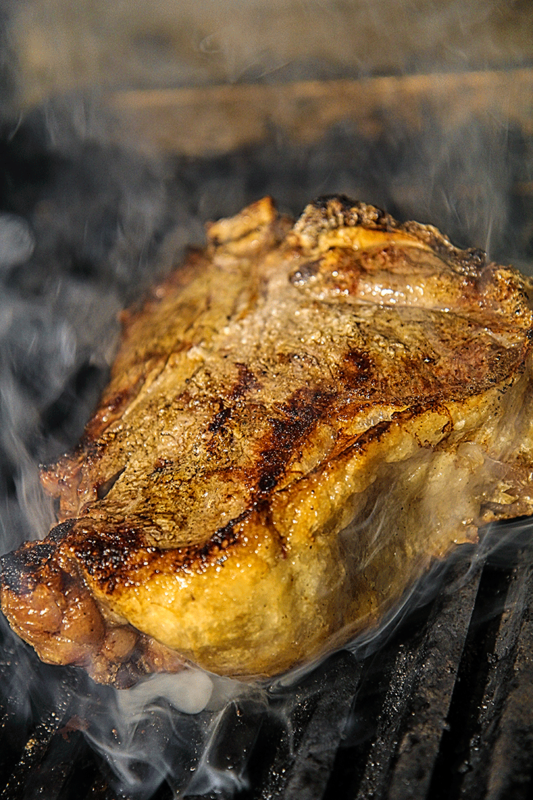 The steak should be turned only once and must be distinctly marked by the grill. The salting of meat should be carried out only after cooking, possibly with coarse salt. It will enhance the flavor of the meat without attacking it too much (while you eat the steak, discard the salt!). Before you can eat it, Florentine Steak must rest between 10 and 15 minutes in a hot environment (such as a heated oven and then turned off) to allow redistribution of the juices. 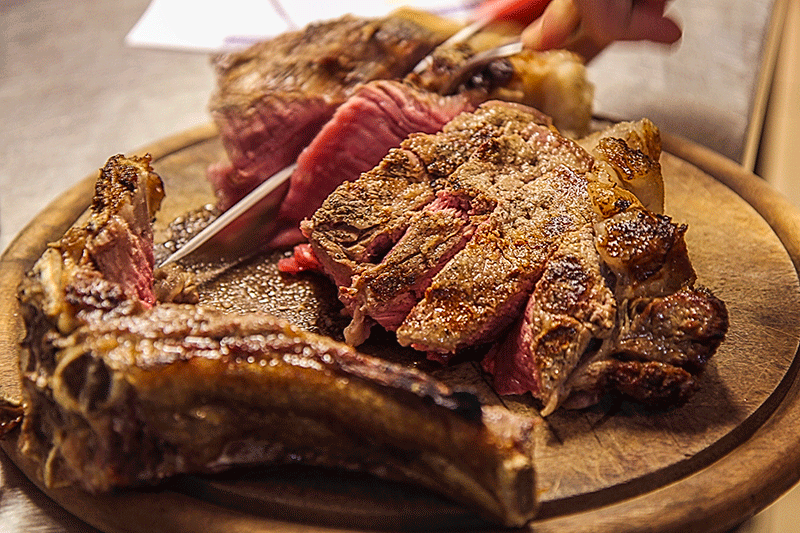 Whether you decide to enjoy the Bistecca alla Fiorentina in Florence or the surrounding countryside, due to a significant amount of meat, share the experience with your friends! To thoroughly enjoy the steak, you must not miss an excellent bottle of Chianti red wine and a few typical Tuscan sides, like roasted garlic potatoes, spinach with Pecorino cheese or Cannellini beans. If you want to take on cooking the Florentine Steak at home, you can find below all the indications; May the Ciccia be with you! First of all, you have to know that the perfect dry hanging is by resting the entire loin in a fresh and dry place before cutting. Therefore, it would be better buy dry hanging meat directly from your butcher. If you need to make it at home, wrap each steak in single cheesecloth. Now, place the steak in the lower part of the refrigerator for up to 4 days, well separated on a rack . Change the cheesecloth once a day. Finally, analyze analyze carefully the meat before consuming. It have to be darker, with a stronger smell, with not trace of ammonia smell that suggest a wrong maturation. If you can, prepare the grill with coal or wood embers. Alternatively use an electric grill or a cast iron griddle. You can get great results also with a soapstone griddle. Heat very well the surface chosen to cook the steak. Place the Porterhousesteak standing on the bone to warm the interior and soften the fat fiber. Continue for 15 minutes in this way. Now, heat at a very high temperature about 5 minutes per side without moving the meat. This step is particularly delicate: the surface of the meat should roast very well without burning, finding the right temperature depending on the tools at available. Let the steak rest in a warm place (e.g. an oven previously heated then turned off) for about 10-15 minutes. This way the fiber of the meat will relax themselves redistributing the juices and retaining the flavors into the steak. Serve the Florentine Steak after sprinkling it with cooking salt and prepare yourself for a huge meal! As good as it was in Florence. Did this following your method with a 3.4+ pound, 3-inch thick well trimmed porterhouse, USDA prime. Said simply, it was excellent. My gas grill (Weber Summit) must have been a shade cooler than your recipe would suggest. I used a Thermopen thermometer to judge progress, and took 40-minutes initially in the standing position followed by ~20-minutes total on the two sides, 10-min each flipping at 5-min intervals, and a 15-minute rest standing on the grill with the burners off and the hood down to yield a beautiful, very rare result. Visually it is very impressive, and it is knee-buckling good! One tip I would offer – remove the raw steak from the refrigerator and allow it to temper at room temperature 2 hours before beginning to cook it. Thanks for your comment Eric, I’m glad you enjoyed your steak and I agree with your tip! Maybe 1 hour out of the fridge could be enough. Ate a bistecca Florentino at trattoria Mario in Florence week of 6/5/17, what a busy palce. Had to wait with reservations but what a great taste to wait for. A liter of the house wine is the perfect complement. The ravioli are terrific too. Take the time to go. I love Mario! Saturday I will be in Florence for just one day and one night, but unfortunately I will not have time to have a lunch at Mario’s place. Too bad, it has been one of my preferred trattorie in Florence when I use to live in town as a student: convenient, traditional and delicious food! I was actually fortunate to experience Trattoria Mario once; a few years ago. It was so good I dream to get back one day. Wow, you have a great plan Endre! Yup Jim, that’s a great plan! The best steak in the world!! Made it tonight although I did my own thing seasoning the meat with olive oil and coarse ground salt and pepper. Wow! Yeap,after i read more than 10 recipies i think this is the only one original and very detailed…will try it soon.